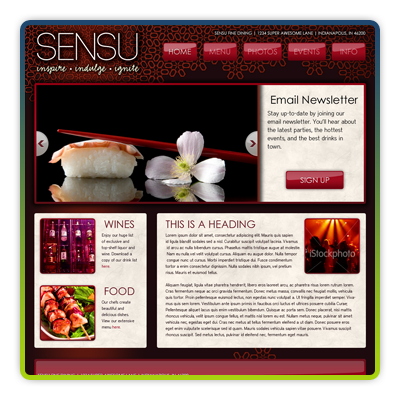 We're very proud to have worked with what is now one of Indianapolis' hottest new nightclubs, Sensu. When we were approached by the team at Epic Hospitality, they wanted a site that reflected the upscale quality of their menu with an Asian theme that promoted the exciting nightlife atmosphere of the club. Additionally, they needed a Content Management System so that they could quickly update their pages, add events to their calendar, and manage their menu. We provided them with a website developed on our NetNinja content management system and launched in early March.